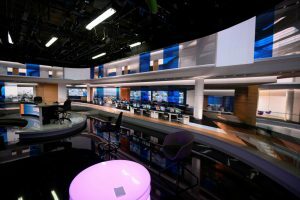 Irish-owned Ion Solutions, a specialist provider of audio-visual solutions to companies nationwide and across the world, has designed and installed state-of-the-art technology in the RTÉ News studio. RTÉ is Ireland’s national public service broadcaster, and its main news studio is home to the Six One News, Nine O’Clock News, One O’Clock News, News with Signing, news2day for young people, The Week in Politics, Leaders Questions, Breaking News Specials, Budget coverage, Referendum results coverage, and other special events live programme coverage such as national commemorations. Studio 3 is the busiest television studio in Ireland, broadcasting over 1,700 news bulletins and programmes each year. Kevin Moore, director of Ion Solutions, said: “We’re delighted that RTÉ News chose Ion Solutions to work on the upgrade of its flagship Studio 3 project. A lot of time and work has been put into this project, and we are happy that we were able to successfully meet RTÉ News’ requirements. Ion Solutions is a leader in the design, supply, installation and integration of audio-visual display systems, broadcast television systems, digital video production systems and computer graphics systems, as well as digital signage and wayfinding solutions. The company was formed in early 2018 when sister companies Eurotek Ireland and Avtek Solutions amalgamated to operate under a single name. The Ion Solutions team includes specialists in IT networking, video engineering, design, integration and sales. The company is 100% Irish owned, headquartered in Sandyford, Dublin and has grown to employ over 70 people.